The horse is physically able to do it. Your horse must be able to physically do what you are asking and it must not cause him any pain or discomfort. If your horse finds something difficult or painful they just won’t want to do it. (And we want trick training to be lots of fun for you – and your horse). If you have an older horse or one that has injuries then look at tricks that are easier for him to do. For example I rarely ask Trigger to do a Full Bow (down on his knee) because of his age. But there is a trick called the Simple Bow which is much easier for older horses to do and still looks really nice. The horse understands what you want him or her to do. If a horse gets confused then they can react by performing bad behavior, trying to escape or just not doing what you ask. 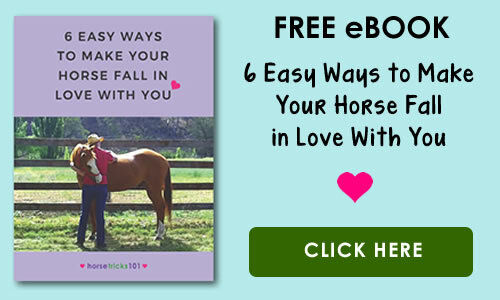 Make sure your horse understands everything you are asking him to do. Horses learn better if they are given simple, easy to understand tasks. So if you want to teach your horse a very complex task then just break it down into simple parts and teach each part. The horse believes there will be a benefit if they do it. Horses do everything for one reason – they believe that there will be a benefit. This benefit could be to avoid something such as punishment or discomfort (pressure) or the benefit could be to gain something such as a reward. However, punishment and pressure encourage a horse to avoid something or try to escape (negative), whereas rewards encourage the horse to seek them out and to try to earn them (positive). So it is important to look for ways to train your horse so they are rewarded. 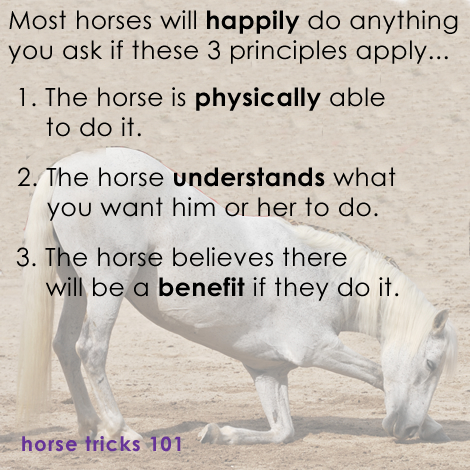 If everything you do follows these 3 principles, your horse will do just about anything your ask!